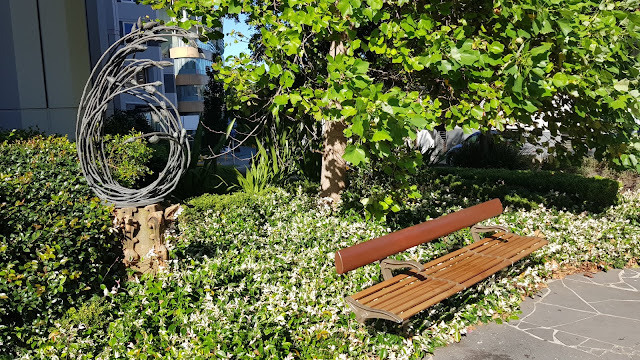 This sculpture and bench are located in Three Saints Square which is bounded by Victoria Street, Oxford Street and Barcom Avenue, in the inner city suburb of Darlinghurst. Three Saints Square was named in 2008 to recognise a trio of local landmarks: St Vincent's Hospital, the Notre Dame University campus and St Sophia Greek Orthodox Church. Linked to: Shadow Shot Sunday, InSPIREd Sunday, Sundays In My City, All Seasons, Floral Friday Foto. I like it, it's very tasteful. ...the art is a bit difficult for me to understand too. wait a moment. it is good now? that was so twilight zone?? odd. Not sure what you were seeing, Elizrdbth, but I haven't had any changes in quite a while. What a poignant sculpture and beautifully fitting these three organizations! (Though I know some would not agree with calling a church an organisation:)) Many thanks for sharing this whimsical sculpture with All Seasons! Have a great week, and before I "send" this comment, if it does not immediately appears, please let me know if it eventually gets through - thanks so much! It looks like a pleasant place to rest and meditate.